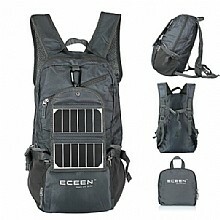 Solar Foldable Hiking Backpack (ECE-635Grey),foldable solar backpack, solar power bags, folding solar backpack, solar hiking backpack, solar hiking daypacks, solar charger backpacks, solar battery charger bag, solar cell phone charger bags,ECEEN Electronic limited. 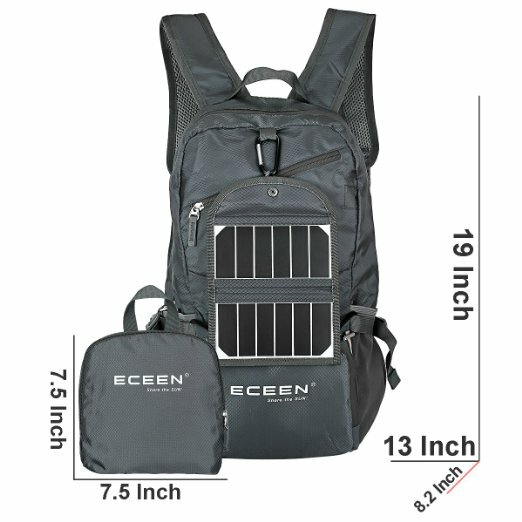 •	THE PERFECT UNDER-SEAT FLIGHT CARRY-ON - The ECEEN® solar powered daypack is an ideal small hiking or travel daypack, or for biking. The perfect size for use as an under seat bag for essentials during your flight. Take it to work for use on your lunch break or whilst getting to/from work. 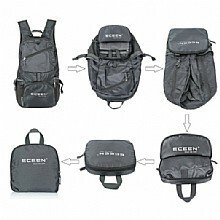 It folds up into a compact carry pouch that will take little room or weight in your main backpack, handbag or briefcase. •	Ultra-Light. Ultra-Durable. Ultra-Awesome - The backpack is perfect for day-to-day use or occasional travel, and great gift for everyone. It's made from highly rip and water resistant fabric, provide strengthen and long-lasting performance with minimal weight. Stress points are reinforced with bar tacking for increased longevity. 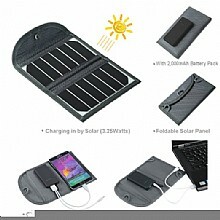 •	REMOVABLE & FOLDABLE SOLAR CHARGER - 3.5Watts foldable solar panel removable from main packs, 22% high efficiency transfer solar cells in a protective anti scratch hardened coating sewn into high-wear PVC fabric for weather-resistant outdoor durability. •	CHARGE A VARIETY OF DEVICES EVEN AT NIGHT- Built-in 2,000mAh slim and waterproof Li-Polymer Battery pack charge for Iphone, Samsung, other smart phones, External Battery Packs, GPS systems, MP3 Players, Bluetooth Speakers and more even at night! 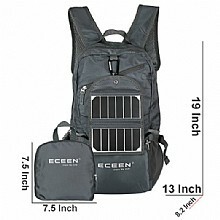 •	PACKAGE CONTENTS - ECEEN® Solar Powered Daypack, 3PCS Carabiners, 1PC* USB to DC and Micro USB cable and 1PC* User manual. Besides, it can store energy for use in the night. You don't need to worry your devices run off power, no matter days or nights. Just enjoy the greatest happiness during your travel. Backpack smartly combined with solar energy to charge on the go. Simultaneously, you can have enough space to restore other accessories like pad, books, gadgets, keys; ideal for hiking, travelling and outdoor activities. Folds into zippered inner pocket to fit anywhere. Unfolds from pocket to backpack. Must have on every trip. A true space saver. Stuff the bag into its own pocket for storage---no extra fees, and unzip it when you reach your destination. Avoid overweight charges, simply unfold from your luggage and use it as a carry on for your excess baggage. Dimensions: Unfold: 19x13x8.2 inches, Fold: 7.49x7.50x3.0 inches. You will not be disappointed with this backpack! Wow! I don't even know where to start with this backpack. 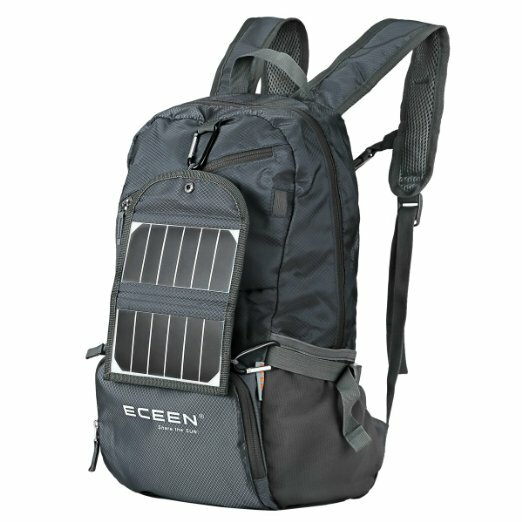 The backpack itself is awesome; the solar power is a great added bonus. When it arrived, it was folded up into a small little pack, which made me think it was going to be a cheap flimsy little backpack. I opened it up and still thought it was a bit on the small side for our hiking needs. We took it out on the trails yesterday and it couldn't have been more perfect. The backpack was easily able to carry all of the snacks, gear, and water that we usually take in a much bigger and heavier pack. I wore the backpack and it was lightweight without being bouncy. The chest strap was comfortable and helped keep the pack in place. I had fully charged the solar panel the day before our hike and when we got on the trail I realized that my gopro battery was dead. I plugged the gopro into solar pack and charged it for an hour and a half while we hiked up the mountain. Once we got up there, the gopro was charged and ready to take pictures. It was so easy to hook the solar pack to the outside of the backpack and charge it back up as we went back down the mountain. This is an awesome bag for day hikes, trips to amusement parks, and I would even recommend it as a diaper bag. It has plenty of pockets and the quality appears to be very good, I expect to get many years of use out of this backpack. This is my second ECEEN solar product and I am again impressed with the quality of there products. This backpack is made of a very high quality light water resistant material. Even though the backpack is made of light material is doesn't feel like is going to rip. There are plenty of pockets both in the bag and outside. The side pocket is able to hold my large water bottle without issue. Each strap has the ability to be tightened and loosened easy. There is a chest strap that works excellent. The solar panel is great here. IMPORTANT NOTE: The solar panel comes with a special 3 way cord usb / micro usb / special adapter plug for the panel. 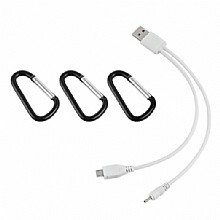 It does work to charge the battery pack via usb however do not use this cable to charge your device. Your mileage may vary but when i tried to charge my Samsung Galaxy S6 with it the battery pack powered off and wouldn't charge my device. The problem is with the cable as i tried using a different usb to micro usb cable and it charged my device just fine. The solar panel should charge the 2000mAh battery pack within 4hrs of direct light however I found it does charge even in indirect light. It looks like they were able to accomplish this by using smaller rechargeable batteries that accepts a trickle charge which works even on a cloudy day. This is awesome for me because I hike where there is little light. Most of my hike I'm surrounded by large trees and the solar charger in this case still works great. I was provided this product in exchange for my honest review.